Balding or thinning hair is generally thought of as a problem that primarily affects men after the age of 40. This may be why it can be quite shocking for young men to suddenly notice hair loss. In young men, hair loss can be very emotionally challenging. Sometimes, this hair loss is temporary, such as when it occurs as a result of significant stress. However, it’s generally advisable for young men with sudden hair loss to visit a physician at a hair restoration clinic. The physician can try to determine the underlying cause of the problem and the appropriate treatment recommendations. Male pattern baldness is also known as androgenetic alopecia. It is the most common cause of hair loss. According to the National Institutes of Health (NIH), androgenetic alopecia affects as many as 50 million men in the U.S. alone. Hair loss in women that is classified as androgenetic alopecia is most likely to develop after menopause. 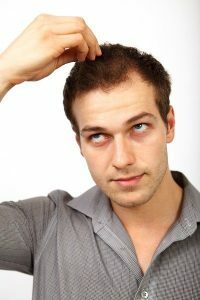 In men, however, it is possible for hair loss to begin in the teenage years. It is believed that androgenetic alopecia may be linked to problems with the AR gene, which allows the body to create androgen receptors. These receptors facilitate appropriate responses of the body to androgens such as dihydrotestosterone (DHT). High levels of DHT have been linked to an increased risk of hair loss in men. It is thought that variations in the AR gene can interfere with normal DHT levels and consequently lead to hair loss. Another possible cause of hair loss in male teenagers and young men is telogen effluvium. Hair follicles cycle through a growing phase, followed by a resting phase, the latter of which is known as the telogen phase. After the telogen phase, the hairs are shed to allow for new growth. When a person experiences significant physical or emotional stress, the hair follicles can be “shocked” into prematurely entering the telogen phase. About two months later, large clumps of hair may be shed. Some possible triggers for telogen effluvium include severe illnesses, major surgery, crash dieting, the death of a family member, or another source of significant psychological stress. Previous Post: « Does Stress Cause Hair Loss?